World Vision is committed to partnering with the people of Myanmar to improve their lives today and to help deliver sustainable solutions for the future of their children, families and communities. Please pray for our work with the poorest children in Myanmar. Mann, 14, lives with her dad and brothers. Mann’s mum died when she was 8 years old and responsibility fell on Mann to take on the role of cooking, fetching water, gathering firewood and cleaning the house. Even with all those responsibilities, Mann goes to school and studies hard. Recently, we have given Mann’s family two pigs to help them earn an income. They were able to sell the first set of offspring to help pay for Mann’s school fees. 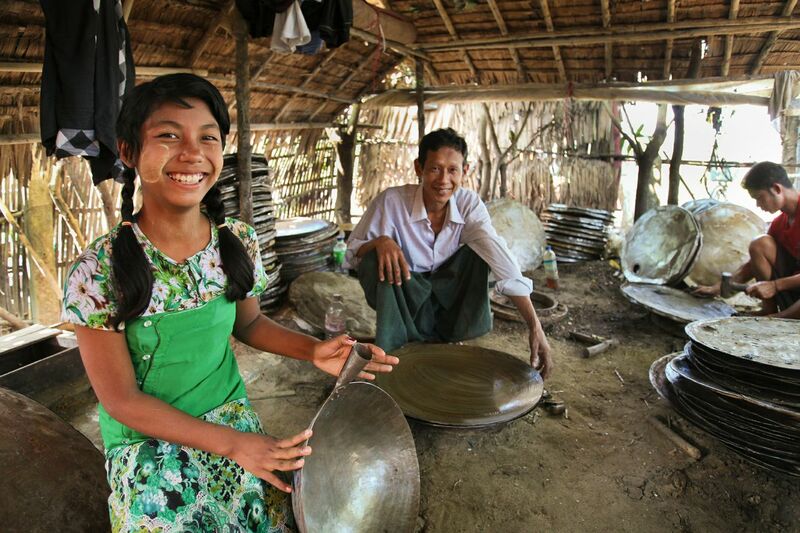 Piang, her older brother, is also attending classes that support parents and caregivers. He has learned about child protection issues and the importance of education. He is now doing more to help Mann with house work like cooking and cleaning. Please pray that God will surround Mann and her family with His peace, hope and love. We give thanks for your support, which enables Mann’s family to access a sustainable source of income. We pray that Mann will be able to finish school and go on to achieve her dream of becoming a nurse. Pan is 8 years old and lives with her mum, Hla, and older brother, 12 years old. Last year, Pan’s dad passed away. Since then, life has not been easy for the family. Hla washes clothes and does household chores for other families to earn an income. As she cannot get regular work, she worries that she will not be able to earn enough to buy food, clothes and pay school fees. Please pray for Pan, her brother and mum. Pray that her mum can get a better paying job so that she can earn enough money to buy nutritious food for the family and the children can continue with their education. We also ask that God will surround the whole family with His love and peace. We give thanks to our supporters who are helping and praying for Pan and her family. Myat is 8 years old and is living with her mother, grandmother and two aunts. Her father died before she was born. During the rainy season, the village where Myat lives was flooded because the water level of the river rose too much. Myat and her family had to move to higher ground and now live in a very small temporary shelter, made from old bamboo matting. Her mother does odd jobs and she faces difficulties earning a regular daily income due to the flood. When the rain comes, they cannot sleep well as the shelter is not safe and they all get wet. Myat is not able to go to school as her school buildings and compound is also flooded. Along with Myat, the flood has affected around 4,500 children. Myat wants to go back to school and wishes that the situation with the flood doesn’t get worse and affect them for too long. Please pray for Myat, her family and other children who are struggling to cope in very harsh conditions. We ask God to protect the children and families in Amarapura and give them strength to overcome this difficult situation. 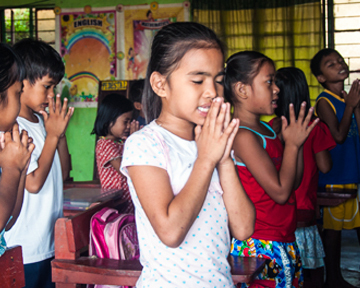 Previously, we requested prayers for Theint, who wanted to continue with her education and also did not want her siblings to drop out of school. Theint and her siblings faced lots of challenges since both parents divorced, remarried and left them with their blind grandmother. We give thanks to God for giving Theint and her siblings a chance to continue their education and bring new hope to their family. Please continue to pray that this family can find better sources of income so that the children can continue their education. Tg Khai is 16 years old and studies in the 8th Grade at school. His house and school are on a hillside seven miles from the town of Tiddim. His family make their living by selling charcoal and vegetables in Tiddim. In recent weeks, there was serious heavy rainfall, which caused landslides and blocked the main road to Tiddim. The family now have to walk to Tiddim, carrying their produce on their heads. Tg Khai requests prayers for the renovation of the roads to town and safety for the villagers on the footpath while carrying goods. Lia is 12 years old and studies in the 6th Grade at school. Like many other children, she is suffering from flu and we are worried it may be H1N1 Flu, as there has been an outbreak in the area. Village health volunteers and local health staff are working hard to contain the outbreak. The Department of Health and World Vision are providing special health talk sessions on H1N1, advising on symptoms and referring people for medical help where possible. We give thanks that by the grace of God, we have not had any H1N1 confirmed cases yet. However, we need close health monitoring and services. We ask for prayer to keep our children and communities safe from H1N1. Also pray for the parents who are struggling to take care of their children involved in the current flu outbreak. This year, the Government have upgraded one of our village schools from Basic Post Primary level (till grade 9) to Basic High School level (till grade 11). Previously, after finishing grade 9, students had to go to Tiddim for Basic High School level. This was very expensive as it meant renting accommodation, food, health services and transportation. As a result, most students would drop out at 9th Grade because families could not afford to send them to study in Tiddim. Lia Awi, who is 16 years old and in 9th grade, is so happy and grateful to the government and other organisations who made this school promotion possible. She no longer needs to worry about dropping out of school after the 9th grade. She can stay with her family and study until she graduates secondary school. Also she would like to thank World Vision and all our supporters for supporting the newly promoted village high school with utilities such as desks, benches and class partitions.